One of my greatest hesitations when I started #Whole30 was the lack of comfort food I would be able to have. I kind of figured everything I liked to eat was strictly off limits. Thankfully that was one of the many misconceptions I had about the reality that is the #Whole30. For Sunday dinner this week we had a mix of #Whole30 doers and some who had the luxury of eating pasta so we decided to do something my nephew loves and since it was his birthday, it was a MUST. 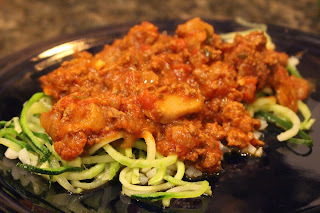 With images of Lady and the Tramp kissing by way of a very long spaghetti noodle I give you one of my favorite meals we have had so far (of course our noodles were substituted with zoodles but I still thoroughly enjoyed it)! In a large skillet, heat the oil (olive, coconut or avocado) over medium heat. Add the onion and saute appx. 5 minutes, stirring very frequently, until onion is soft and translucent. Add the salt, pepper, and mined garlic and saute for another 3-5 minutes. The onions should be carmelized and sweetened at this point. Then add the can of tomatoes, parsley, oregano, basil and bay leaf. Simmer, covered, on low heat for 1 hour, stirring occasionally. Cooking the MeatIn another large skillet, saute onion until translucent. Add the beef and turkey sausage. Once meat is browned, add minced garlic cloves and cook a few more minutes. Add the seasonings/spices and cook until meat is fully cooked. Scrape meat mixture into the Marinara Sauce. Deglaze meat pan by adding a little bit (~1/4 Cup) water to the pan, lifting up the juices and flavors cooked into the pan. Pour this mixture into the marinara sauce. Add the 8oz. can of tomato sauce. Taste it! Add more salt, pepper, seasoning if needed. *optional: Add 1/8 cup. dark red wine for a richer taste. If you like to prep meals ahead of time, this sauce is perfect to make and freeze!